By Swami's Grace, the Russian language translation was dedicated at His Divine Lotus feet on November 21, 2012 - during the period of Swami's 87th Birthday Celebrations. The translation was was done by Veronika Kravtsova, ably assisted by Sai devotees - Natalia Kosareva and Tatiana Mineeva. Natalia Kosareva helped with the editing of the translation, along with all the computer work. Tatiana Mineeva was instrumental in spreading the book and it's message to Russian speaking devotees. When we were translating, typing, proofreading and editing "Sai, Thy Kingdom Come! ", we clearly saw that we were doing this work for Swami and we really felt His Grace and His loving support. It was His Grace only that He made us His instruments. It was He who did all the work and who therefore owns all its fruit. What else can we say? The way this book came into being and the way its Russian translation appeared, looks like a miracle and it IS one of Swami's miracles. Its source is His Love that is beyond our human comprehension and evaluation. He did it for us! I started translating "Sai, Thy Kingdom Come" while I was in Puttaparthi, during our Parthy Yatra. I bought this book in a bookshop by the Ashram gate and started reading it, beginning with the first chapter; and I felt so happy, so inspired, so full of faith and joy! Then I began reading parts of it to another Russian lady, a Sai sister and a very close friend of mine, who does not speak good English, translating these parts into Russian as if I were doing simultaneous translation (as if these parts were already written in Russian). Then she asked me to start from the beginning of the first chapter and switched on an MP3 player and recorded everything. She said that she would type it, we could edit it together and the whole book could be translated this way. I was very happy and inspired! I suddenly felt that I was full of energy; it looked as if a lot of Bliss was poured into me. The whole work was taking place as if "by itself"; and I felt that it was very important to translate this book into Russian as soon as possible and that Swami wanted my friend and me to do it. We suddenly came to know that Tatiana, who had been staying in Puttaparthi for more than 15 years, was very devoted to Swami and known to everybody, but with whom we had never been acquainted too closely, was looking for a Russian translator to translate ‘Sai, Thy Kingdom Come” into Russian. We started talking about the book with her, felt very inspired and became good friends. We all felt that Swami wanted us to do this Seva. We all wanted to spread the news of Swami’s coming and the beautiful times to come among Russian speaking devotees. I was recording the translation with the help of the MP3 player, my friend was typing it on a notebook computer, editing the text; then I edited and proofread the text, reading each of the English and Russian sentences very slowly; then we read the same part together again. In this way the first 6 chapters had been translated before we left the Ashram to fly back to Russia. While we were working on the Russian translation of the book, I kept thinking about Swami's "return" most of the time and I wanted to share this information with my Russian speaking friends as soon as possible. Since English is my profession, I know it well, but most of Russian speaking devotees are poor in English or don't know it at all. So, they can't read this book, unless it is translated. More and more people came to know about the book and what's been written there and became very eager to read at least the parts that were translated as soon as they were translated. Very soon there was a group of Russian devotees thinking in the same direction and waiting with a lot of faith and patience for Swami's return. I started sharing the translated parts with them, sending them by e-mail, recording them on their flash drivers, printing them on paper for those who didn't know how to use computers. The news of Swami's "return" spread almost with the speed of thought and lots of people started praying "Sai, Thy Kingdom Come" and thinking about it. 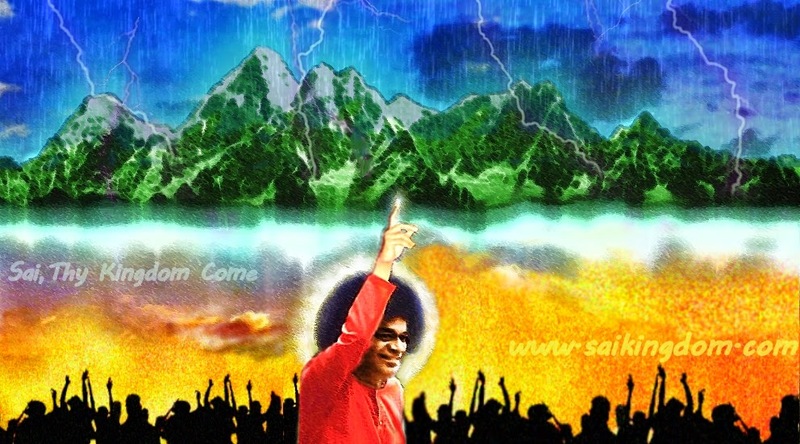 When the first 6 chapters of the book were on the site http://www.sathyasai.ru/, I was extremely happy: I thought that it meant that very many Russian devotees would also know about Swami's "return" and that a lot of Sai devotees not only in Russia, but in Kazakhstan, Uzbekistan, the Ukraine, Belorussia and other countries that used to be a part of the former Soviet Union where Russian was the state language, people, whom I did not know personally, could also have if not faith, then at least hope. I feel very inspired and understand the importance of this information to the people. I hope that it would be a good translation, since I am a professional translator and interpreter and I am praying to Swami to be His Hands and just an instrument and I am laying all the fruit of this Seva at His Lotus Feet. Sai Ram! Tatiana Mineeva is from Russia and currently lives in Puttaparthi. It is difficult to find another devotee who has as much conviction in Swami’s Reappearance as Tatiana. Since Swami left His body, Tatiana has been telling every Sai devotee whom she meets, not to believe in His Maya “disappearance” and that He will be back in the same Sathya Sai form. Tatiana, along with Veronika Kravtsova and Natalia Kosareva, was instrumental in getting Sai Thy Kingdom Come translated to Russian and spreading the book and the belief of His Reappearance among Russian speaking devotees. In this article (originally written in Russian and translated to English by Veronika Kravtsova), Tatiana expresses her strong faith in His Reappearance and narrates an incredible experience that she had, which points to Swami’s return. I have been waiting for our beloved Bhagawan Sri Sathya Sai Baba to manifest Himself in the form that is visible to us and give His Darshan, ever since the moment He was in the hospital. I do believe that everything that we are now witnessing is His Divine Leela. I am sure that He will ‘return’ in His Sri Sathya Sai Baba Avatar form and I keep telling this to all the Russian Sai devotees whom I meet in Puttaparthi (where I have been staying for a number of years). I find that there are many people who share this conviction with you and me. After your book had been published and sold in Puttaparthi, their number started increasing. I recommend everybody to buy and read your book and I am so grateful that it exists! I am sure that whatever Swami said is bound to happen and is the Truth. He is the Avatar! It is not correct to diminish Him by thinking that He is a human being with a human body. He told Hislop that the whole Universe and all the billions of living beings in it are just in that thumb of His! He said: “Everything is in this hand!" He told one lady from California in an interview in the 80s:“What you see in front of you is not a usual human body: there is nothing but Jyoti (Light) behind this skin, no usual human organs, no kidneys, no liver, nothing!”. He also said that He did not depend on the five elements out of which our human bodies consisted; the five elements depended on Him for their existence. He said that each moment millions of Universes were created and destroyed in His causal body. I am thinking: how could it possibly be that Swami allowed to put Himself in a hospital, allowed the doctors there to touch Him, to operate on Him?! It all seemed so absurd and remained a mystery until I found something that gave me a clue and that I would like to share with you. Swami once shared a story about Lord Rama. Before Ravana came to steal Mother Sita, Lord Rama had said to Her: “You know with what mission We have come. Now it is time for you to go into the fire and stay with Agni Deva!” She did what Rama told Her to do and stayed with Agni Deva. Maya Sita, that looked exactly like Her, stayed in Her place. When Ravana came, he stole Maya Sita and not the real Sita. The real Sita was never taken away! When Lord Rama killed Ravana and Maya Sita came back, He told Her to step into the fire, creating this Leela that shocked people. Maya Sita stepped into the fire and the real Sita (who had been safe with Agni Deva, having been His guest all this time) came out. Perhaps our beloved Swami has NEVER been to the hospital! He has NEVER been operated on, He has NEVER left His body, nothing wrong has ever happened to Him! This could all be just His Leela, a drama played by Him for some very important purpose that only He knows about! He could still be in His body that is quite young and healthy, hiding from us and watching each of us and guiding us and showering His Love on us – and will show Himself to us again very soon in all His glory, revealing at least SOME of His Divinity to us to transform us and the entire world! I would also like to share ONE OF MY DREAMS with you. In your book, you quote Swami who spoke about lifting a whole mountain range, not just one mountain Govardhana as Lord Krishna did. You mention in the book that "Swami could have been using a metaphor to explain the enormity of His task. However, with Swami anything is possible!". The dream is about something that I believe is bound to happen. It has to do with some time and conditions when Swami will really do it on a PHYSICAL level. Before I share this dream with you I want to tell you that I PERSONALLY heard Swami talking about His lifting mountain range in His discourse on Sri Krishna Janmashtami and I heard Him saying that it would happen during the life span of THIS AVATAR. Some people had debates with me after we have heard it: they couldn’t believe that it would happen on the physical level and thought that it was a metaphor. I told them that Krishna had done it on a physical level and that because of this manifestation of His Divinity not only many people were saved from a terrible disaster, but their devotion and faith were also raised to a new level. Swami could do the same with all of us, but now it could be on a global scale. Here is my dream that I saw in 2004 after this conversation with my friends had taken place. It was a very vivid dream that I remember very clearly. All of a sudden everything disappears. I find myself in a strange place that is difficult for me to describe: some kind of space with nothing in it. I can’t see anybody or anything, but I am overwhelmed by a most strong feeling that I have never ever experienced or imagined before, something for which the words of our human language are too small to embrace it. Terror, horror, anguish, despair, agony are all too small to fit this feeling. It is a state of an awful shock. I know that I am witnessing something: some kind of events happening around me in this environment. Each cell and atom of my body feels and senses and knows what is going on. I wake up and open my eyes. I did not share this dream with anyone for a long time, because I thought that it was not the right time to do it. Perhaps the right time has come! I do not know what is in store for us, time will show it. I only believe that whatever Swami says is the Truth and will happen JUST THE WAY HE SAID they would. I also believe in His immense Love and Grace and that we’ll always be together. Thank you for all the work you are doing, for being willing to be Swami’s instrument, it is such a support for me and many people whom I know. I wish you all the best! May all be happy! WHERE ARE YOU SAI KRISHNA?